As World War I rages and the Romanov dynasty reaches its sudden, brutal end, a young jewelry maker discovers love, passion, and her own healing powers in this rich and romantic ghost story, the perfect follow-up to M.J. Rose's "brilliantly crafted" (Providence Journal) novel The Witch of Painted Sorrows. Nestled within Paris's historic Palais Royal is a jewelry store unlike any other. La Fantasie Russie is owned by Pavel Orloff, protégé to the famous Faberge, and is known by the city's fashion elite as the place to find the rarest of gemstones and the most unique designs. But war has transformed Paris from a city of style and romance to a place of fear and mourning. In the summer of 1918, places where lovers used to walk, widows now wander alone. So it is from La Fantasie Russie's workshop that young, ambitious Opaline Duplessi now spends her time making trench watches for soldiers at the front, as well as mourning jewelry for the mothers, wives, and lovers of those who have fallen. People say that Opaline's creations are magical. But magic is a word Opaline would rather not use. The concept is too closely associated with her mother Sandrine, who practices the dark arts passed down from their ancestor La Lune, one of sixteenth century Paris's most famous courtesans. But Opaline does have a rare gift even she can't deny, a form of lithomancy that allows her to translate the energy emanating from stones. Certain gemstones, combined with a personal item, such as a lock of hair, enable her to receive messages from beyond the grave. In her mind, she is no mystic, but merely a messenger, giving voice to soldiers who died before they were able to properly express themselves to loved ones. Until one day, one of these fallen soldiers communicates a message--directly to her. So begins a dangerous journey that will take Opaline into the darkest corners of wartime Paris and across the English Channel, where the exiled Romanov dowager empress is waiting to discover the fate of her family. 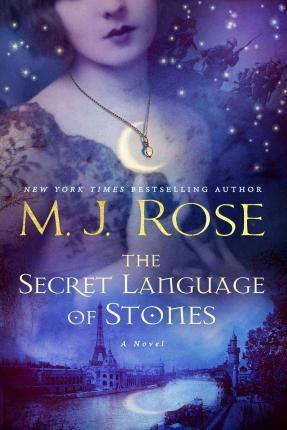 Full of romance, seduction, and a love so powerful it reaches beyond the grave, The Secret Language of Stones is yet another "spellbindingly haunting" (Suspense magazine), "entrancing read that will long be savored" (Library Journal, starred review). "Rose transports the reader 100 years into the past into a city known for romance but torn apart by war...Rose's best novel to date." --Jeff Ayers "Associated Press "